MySQL is the most popular open source relational database management system (RDBMS). It is the heart of the web application software stack called LAMP. All popular application such as WordPress, Joomla, phpBB and more work on Linux using this LAMP setup (Linux, Apache, MySQL, PHP). 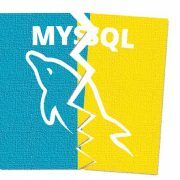 Even some large websites including Google and Facebook somewhere use the MySQL to carry out important tasks. So, here we will talk about top available Mysql database management software or front-end MySQL GUI tools. 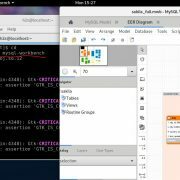 What is MySQL GUI tool? MySQL Database itself doesn’t have any king GUI (Graphical User interface) to easily manage the created database and its users. So, if you are not very much acquainted with the command line interface then it would be a pain to manage databases, moreover, even professionals need some MySQL GUI tool when it comes to handling large databases. So, either you are a newbie or profession, the GUI based tools to manage the MySQL will help you a lot. 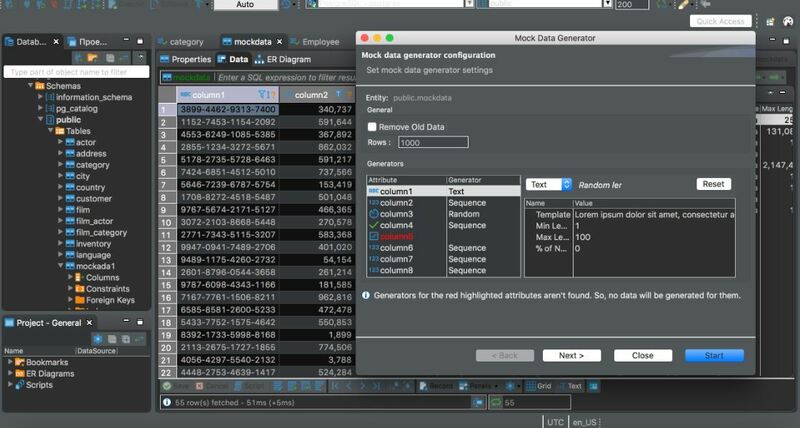 As they not only aid in the Database management but also can use to design database structure, see data visually, Monitor database condition and more, however, its all depend on how much is the MySQL GUI tool you are using capable of? MySQL GUI admin tools allow the user to interact with the database using the graphical icons, visual indicators and navigations. 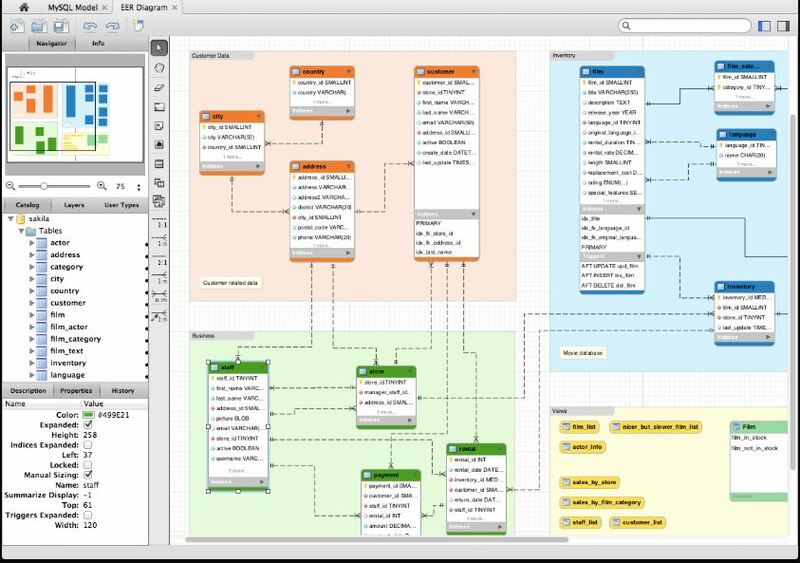 There are some top and best MySQL GUI Tools available to integrate with the MySQL to make you work with the relational database structure easily and visually. In the same context, we have gathered some well-known front-end MySQL GUI Database management tools. DBeaver is another up to date database administration tool with GUI (graphical user interface). It provides an SQL client that uses JDBC API via JDBC driver to interact with the relational databases. It provides a modular architecture as its features can be enhanced using the plugins which are based on Eclipse plugin system or architecture. Furthermore, the DBeaver comes with an editor where the syntax highlighting and auto code completion are also possible. It is developed in Java and based on the Eclipse platform. DBeaver is available in both enterprise and open source versions. The open source one is free to use and distribute. It supports a variety of databases such as MySQL and MariaDB; PostgreSQL, DB2 (LUW), EXASOL, Teradata, Vertica, Apache Phoenix, Netezza, H2, SQLite, SnappyData and more. Available for Windows, MacOS, Linux and Eclipse (using plugin). ClusterControl is a premium MySQL management system GUI but also available in community version which is free to use, of course, there are few features those are only available in paid versions only, still, the free one can do a lot of help. It provides an interface to manage all databases at one place with abilities like deploying a database, monitor, manage and scale MySQL instances. 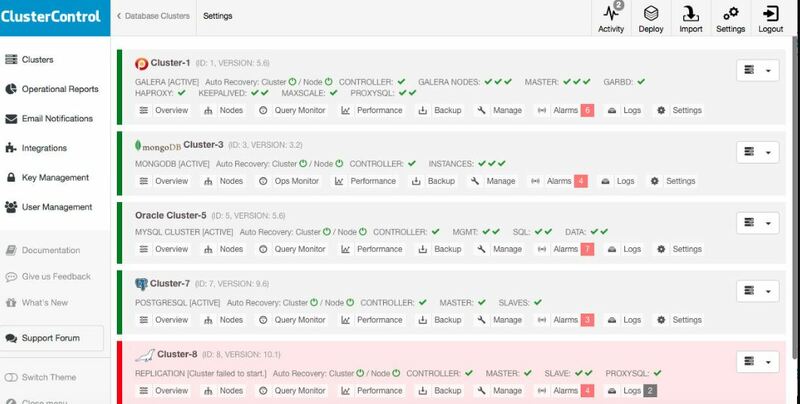 If you want features like load balancing, backup & restore, failover, etc. then you need to upgrade for a premium plan. Moreover, the free version of the ClusterControl also allows deploying not only the MySQL Database technology but other Open source DBM systems such as MariaDB, Percona, MongoDB, PostgreSQL, Galera Cluster and more. Multi-dc view, as well as a deep-dive view monitoring, is available to keep an eye on the performance. HeidiSQL is also free and open source MySQL administration tool to provide a GUI front-end. It even works for the MySQL forks including Microsoft SQL Server and PostgreSQL. HeidiSQL was originally pulled from another software code-named as MySQL front 2.5 software by the German developer Ansgar Becker. It features all common features those you get in the MySQL Workbench from managing databases to tables, views, procedures, triggers and events. However, the best thing apart for Windows and MacOS, it also available in Portable version; which means you can save it on a Pendrive and use on the go on any system. Ability to store credentials stored. phpMyAdmin is another open source MySQL database management tool written in PHP. 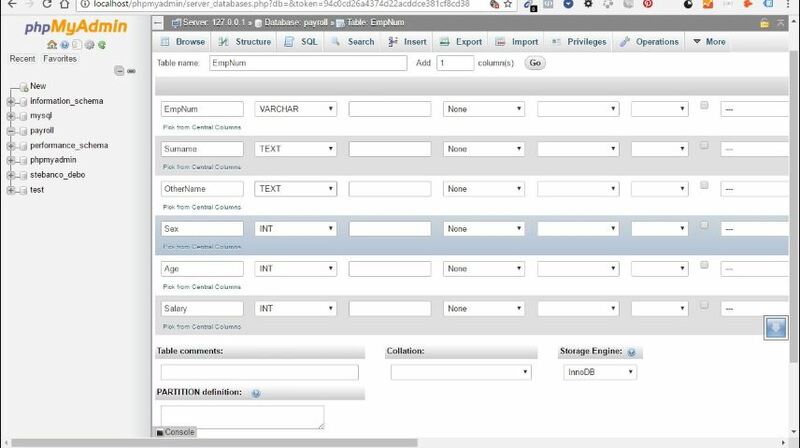 It provides a web interface to connect the MySQL and MariaDB server. It allows databases to manage tables, columns, relations, indexes, users, permissions, etc. It is a most popular tool that used in most of the hosting platform to give graphical user environment to manage Database and its user, and ability to directly execute any SQL statement. It is available in 72 languages and supports both LTR and RTL languages. Export data to various formats: CSV, SQL, XML, PDF, ISO/IEC 26300 – OpenDocument Text and Spreadsheet, Word, LATEX and others. MySQL server activity like connections, processes, CPU/memory usage, etc. 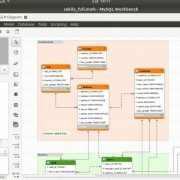 Valentina Studio is a free MySQL database management software that comes in premium version too with some extra features. It is available for Windows, MacOS and Linux. Data management, database design and reporting are some core features of this free database management tool. 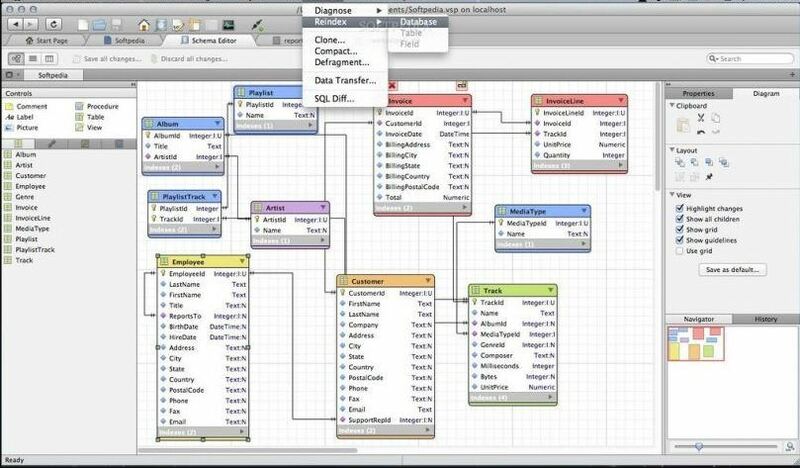 Create diagrams for existing databases. Add new objects to diagrams. Webmin is an open source tool which does not delve into the MySQL databases like the MySQL Workbench or DBeaver but it’s a complete package that allows any newbie to install and manage whole Unix based web application system LAMP. 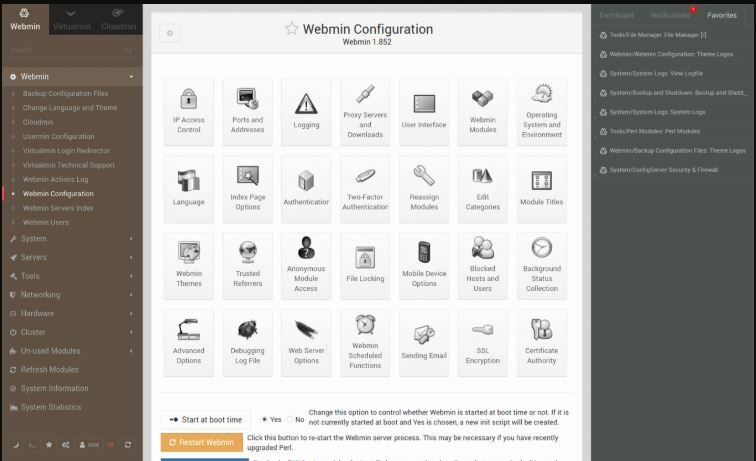 However, the recent version of the Webmin can be installed on Windows but users prefer it on Linux. 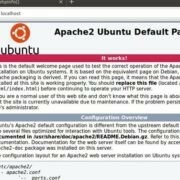 It is possible to manage user accounts, Apache, PHP or MySQL, DNS, disk quotas, configuration files without editing the files like /etc/passwd. The Adminer is can prove a good alternative to the most popular PHPMyAdmin tool. Previously, the Adminer was known as phpMinAdmin and it can be used easily to manage the MySQL databases using the graphical user interface. This MySQL database management tool can handle PostgreSQL, MS SQL, SQLite and Oracle databases. It is a single PHP file tool that distributed under the Apache license that means this is also open source and free to use. It also supports a plugin system to expand the capabilities. Connect Database server using the credentials. Basic functions like PHPmyAdmin such as create, alter, link, browser, drop a Database. 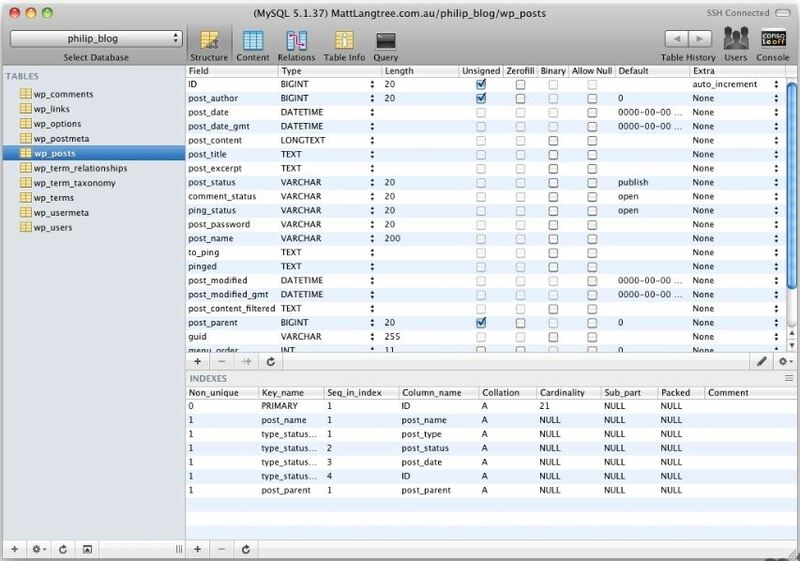 If you want a dedicated MySQL database management tool which allows managing the MySQL Database on Mac. It is descendant of CocoaMySQL with the ability to remove databases and tables, add, edit and remove rows, perform custom queries, change fields and indexes, view and filter table content, and dump tables or entire databases. It is available in 5 additional languages, including Russian, German, Swedish, French and Japanese. ClusterControl No No Yes DSL Percona, MariaDB, MongoDB, PostgreSQL, Galera Cluster and more. Nice article, but where is dbForge Studio for MySQL? I think it should be added to the list as well.